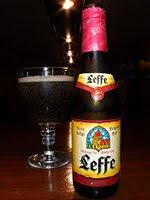 "Leffe Radieuse - Abbey of Leffe Radieuse is a highly fermented beer to be savoured. The ingredients are dark malt, corn, water, hops and spices (coriander, among others) and yeast which give it a bronze colour. The alcohol content is 8.2 %, the ideal serving temperature is 5° to 6 °C and the service ritual is that of bottled beers to be savoured. Leffe Radieuse has the taste of a rich and earthy bouquet with a creamy head. The taste is powerful where the fruity, the sweet, a hint of roasting and the dryness of the hops are apparent. The after-taste is long and warm. It is a very complex beer, that is to say, a beer for Epicureans!" This ale pours a reddish orange colour with a one finger off white head. The head is gone within seconds and leaves some coarse legs behind. The aroma has a sweet malty scent with a spicy grassy note. I also detect a little alcohol. The taste is sweet with dark fruit and has a bitter grassy finish. It has a fine carbonation and a medium mouth feel. enjoy the Abby ales this is one to consider.I hope the LCBO stocks this again this year.This Abby brewery has many great ales to try. I would rate this ale an 8 out of 10.